Will the real Christmas poet please stand up? Did Dr. Clement Clarke Moore really write "A Visit From St. Nicholas"? It is doubtful if he did. In all probability, the author of the Christmas classic was Henry Livingston, Jr., a Poughkeepsie, N.Y., native, who passed away in 1828 at the age of 80. 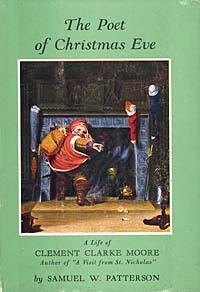 To verify the contention that Livingston wrote the beloved poem, it is necessary to destroy the assumption that Dr. Moore, a distinguished scholar and professor of Oriental and Greek literature at New York's General Theological Seminary, penned the masterpiece on a snowy Christmas Eve as a treat for his youngsters. Logically, once this is done, it is mandatory to establish that Livingston was indeed the true author. The story of Clement Moore and how he supposedly wrote "A Visit From St. Nicholas" is well known. Of course, ther eare a few variations to the theme. One version has the opening lines of that verse popping into his head as he trudged through the snow towards home on Christmas Eve, 1822. Another account has him scribbling the poem down right after dinner that memorable eve, so that he would have "a surprise" ready for his youngsters. Another story is that he sat down long before dinner that December 24th, and carefully penned the delightful poem. Those various accounts all blend together when it comes to the actual reading of the poem. He is supposed to have read the poem to two of his three children on Christmas Eve, 1822. The third youngster, it should be noted, was much too young to have appreciated the classic. Once the poem was read, Moore reportedly filed it away in a drawer, and forgot about it. He was a scholar, and such frivolous nonsense was beneath his dignity. He yearned to achieve greatness by penning scholarly tomes. He dreaded the thought of the populace knowing he had created such a bit of fluff. Be that as it may, or so the story goes, he allowed a relative, Miss Harriet Butler of Troy, N.Y., to make a copy of the poem. In those days, it was fashionable for young women to have "albums", in which they copied down favorite poems, recipes, thoughts, and anything else worthwhile that came their way. The following Christmas, Miss Butler allegedly sent a copy of the poem to Orville Holley, editor of the Troy Sentinel. It was sent anonymously, and it was published in the December 23, 1823, issue of the newspaper. "We know not to whom we are in debted for the following description of that unwearied patron of music - that homely and delightful personage of parental kindness, Santa Claus, his costume and his equipage, and he goes about visiting firesides of this happy land, laden with Christmas bounties, but from whomsoever it may come, we give thanks for it. There is, to our apprehension, a spirit of cordial goodness in it, a playfulness of fancy and a benevolent alacrity to enter into the feelings and promote the simple pleasures of children which are altogether charming." The Sentinel editor obviously knew a masterpiece when he saw it. The newspaper used the poem in its Christmas issues for the next two or three years. As near as can be determined, it was forgotten for a couple fo years after that. Then on January 1, 1829, the New York Courier published the poem with a query as to who wrote it. A week or so later, the newspaper received a reply from Troy Sentinel editor Holley. "A few days since, the editors of the New York Courier at the request of a lady, inserted some lines descriptive of one of the visits of that good old Dutch Saint, St. Nicholas, and at the same time applied to our Albany neighbors for information as to the author. That information, we apprehend, the Albany editors cannot give. The lines were first published in this paper. They came to us from a manuscript in possession of a lady of this city. "We have been given to understand that the author of them belongs, by birth and residence, to the city of New York, and that he is a gentleman of more merit as a scholar and a writer than many more of more noisy pretensions." Undoubtedly, editor Holley had, by that time, located Harriet Butler and she, in turn, had informed him that Clement Moore was the author of the poem. The use of the word "more" three times in the last sentence is believed to have been an obvious hint that the poet might have been an anonymous individual with a name that sounded similar to "more". Seven years later, Dr. Moore published a book of poems. It was called Poems by Clement C. Moore". One of the 37 poems was "A Visit from St. Nicholas". It was at this point that Moore was accepted, once and for all, as the author of the Christmas classic. In the preface, he wrote: "I have composed them all as carefully and correctly as I could". This may be true. But according to historian Helen Wilkinson Reynolds, five of the poems were definitely not written by Moore. One was translated from the Greek, two from the Italian, one was written by a poet named William Bard and another by a poet named Phillip Hone. It should also be noted that, for the record, two of the poems were penned by Moore's wife. However, the scholar clarified this point in his preface. Nevertheless, it is not unreasonable to assume that one more of the poems, the one called "A Visit From St. Nicholas" - may not have been composed "carefully and correctly" by Moore. It may be argued that Moore had a technical right to claim the Greek and Italian translations as his own. But surely he had no right to claim the works of the two other poets. Simply stated, the only thing positive about Moore's case is his claim of authorship in his book of poems. And his authorship of five of those poems has already been challenged. So why not a sixth? Let us now turn our attention to the forgotten man in the case - Henry Livingston, Jr. He was born in Poughkeepsie, N.Y., in 1748, and lived there most of his life. He earned a commission as a major during the Revolutionary War, and served with the Continental Army in the Canadian campaign. He was a farmer, a surveyor, a justice of the peace, and he enjoyed penning amusing poems for his children. His favorite expression was reportedly "Dunder and Blitzen". For 30 years, his descendant, Dr. William Livingston Thomas, a prominent researcher in the field of allergy, endeavored to prove that Major Livingston wrote the poem. Dr. Thomas, who died in 1894, spent several years trying to locate a copy of "A Visit from St. Nicholas" supposedly published in a Poughkeepsie newspaper prior to 1823. He never found the issue. Shortly before his death, Dr. Thomas passed the torch to his son, W. Stephen Thomas, a former director of the Rochester Museum and Science Center. Said W. Stephen Thomas: "It is generally acknowledged that the poem first appeared in the Troy Sentinel in December, 1823. But the Livingston family has given written and oral testimony that it was published long before in a Poughkeepsie paper where many of Major Livingston's poems appeared." The poem may have appeared as early as 1801, according to Thomas, in a newspaper known as "The Eagle." He said: "It could easily have been one of the Carrier's addresses' prepared as inserts around Christmas. "My father spent 30 years going through old newspaper files, but found no trace of what we are looking for. However, there are many great gaps in these files." There is a story about a governess who was employed by the Livingston family about the time Major Livingston read his Christmas poem to his children. According to this account, the governess was a friend, or relative of the Moore family, and brought a copy of the poem to the educator's home one Christmas. It is believed that this is how the Moores came in possession of the poem, and that, as the years went by, it was mistakenly assumed Clement Moore, who wrote serious poetry, penned the classic. "There is solely oral tradition about the governess. I do not believe that her name appears anywhere. It has always been assumed she sent the poem to the Troy sentinel. Our tradition says she was a governess, or at least, a friend of both the Livingston and Moore families. When the editor printed it, he may have assumed the authorship was Moore's. "Interestingly enough, Henry Livingston was still alive in 1823. He died in 1828. But that doesn't prove anything, as he might never have seen the Troy Sentinel. Even if he did, all his pieces were published anonymously or else with some intials not his own. I wonder whether he had some complex about not claiming his own work. It could be that as he was an amateur, he felt his stuff was trifling. It is hard to say." Thomas pointed out that as early as 1860 a historian by the name of Benson J. Lossing challenged Moore's authorship of the poem. Lossing reported felt that Livingston, with his anapaestic rhythm, was the man who created the jolly elf with round little belly. The story of the poem supposedly was passed on from the major's children to their children and so forth up until the present generation. In 1789 Eliza Livingston wrote a letter to Mrs. Annie Thomas, a great granddaughter. "Your letter has just reached me and I hasten to tell you all I know about the poem 'Night Before Christmas'. It was approved and believed in our family to be Father's and I well remember our astonishment when we saw it claimed as Clement C. Moore's. "My father had a fine poetical taste, and wrote a great deal of both prose and poetry, but not for publication, but for his own and our amusement; he also had a great taste for drawing and painting. "When we were children he used to entertain us on winter evenings by getting down the paint box, we seated around the table, first he would portray something very pathetic, which would melt us to tears, the next thing would be so comic that we would be almost wild with laughter. And this dear good man was your great-great-grandfather. "Many years after my father's decease, which took place more than 50 years ago; at that time my brother, in looking over his papers, found the original in his own handwriting, with his many fugitive pieces which he had preserved. "And then too, the style was so exactly his, when he felt in a humorous mood. We have often said, could it be possible that another could express the same originality of thought and use tyhe same phrases so familiar to us, as Father's! What my brother Edwin said to your mother, no doubt, was true, but I do not remember the circumstances. I remember my brother Charles took the poem home with him, he was then living in Ohio, and I have an indistinct idea that he intended to have it published, but I am not at all sure of that point, so don't like to assert it as fact." What became of the original manuscript? [Wow! There are two items being confused here. Eliza's brother and Henry's son Charles had taken from his father's papers after his father's death a publication clipped from a newspaper. Charles tread it to family and friends, telling all of them that he had seen his father come out of his den under the stairs with the poem still wet in his hands, and had heard Henry read the poem to the children as his own work. He kept the clipping in a drawer of a bookcase which was inherited by his daughter Jane [Patterson Livingston] Hubbard. She kept it in the same drawer and one day found it gone. She had no idea when or how it was lost. Henry's son Sidney Montgomery Livingston was the one who found the manuscript version of the poem, with the original crossouts. He took it home with him and, when he died, he left it to his brother Edwin. Edwin moved to Wisconsin to be with his sister Susan [Livingston] Gurney, and it was in one of Susan's house fires that the manuscript was burnt. Now at this point, it is possible to present an impressive array of Livingston descendants and their memories, - either directly, or indirectly - of the major and the poem. But these letters are repetitious, and to a degree, because of conflicting dates, they may confuse the issue. Let it suffice to say that for more than a century-and-a-half, the family has been convinced that Henry Livingston, Jr., was the true author of "A Visit from St. Nicholoas." Also, that the family has countless letters, many of them dating back into the 19th Century, that would seem to verify this claim. But the strongest evidence of all is the poems written by Moore and Livingston. Once again, if you become too wrapped up in your subject matter - the point you are trying to make may be lost in the shuffle. For this reason, we will limit ourselves to a typical poem by each of the two men. Those wishing to challenge the conclusions reached can do so by checking out other poems written by Moore and Livingston at their local libraries. [Unfortunately not. The Thomas family had the only manuscript copy of Henry's poetry. As for Moore's "Poems", I found them almost impossible to obtain in 1999 when I was trying to understand if I believed the family stories or not. Every research library that had a copy wouldn't let it be read without my being an "official" researcher. Curiosity wasn't a good enough reason. I suspect that the book was printed on paper that was not of the highest quality, and it was susceptible to damage. After six weeks of searching, I discovered the poems on microfilm at Brown University in Providence RI. As I watched the poems spool out onto printer paper I realized I had become convinced. Moore's poems weren't just unavailable because of the rarity of his book. They weren't available because no one had reprinted them because he was such an awful poet! That's my opinion still after all these years. Do the research for yourself and make up your own mind. Are tumbled in heaps and lye huddled about..."
The meter of this poem is the important point: Also the humor and mood is obvious. Moore did not use this style. Here is a poem which he wrote for his daughter begging her not to study too hard. Now the point here is clear. Moore was the scholar, even though he was urging his daughter to avoid "strained research." And Livingston was the humorist, the type of poet who could very well have penned "A Visit From St. Nicholas." Burton Stevenson, in his book, "Famous Single Poems", supported the contention that Moore was the poem's author. "However, if no one else had claimed it, and if its authorship had to be decided on internal evidence alone, 'A Visit From St. Nicholas' might fairly be held to resemble the work of Henry Livingston much more closely than it resembles the work of Clement C. Moore. Humorist James Thurber was one of those firmly convinced that Livingston was the real author of the great poem. Henry Noble McCracken, the late president of Vassar, also strongly supported the Livingston claim. For myself, I regard the 'Brother Beekman' lines so much in the form of the 'Visit', as to make it extremely likely that they are both from the same hand. On the other side, the verse that the man, to whom the 'Visit' by tradition is ascribed, was accustomed to write, has no formal resemblance to that piece whatsoever. I most certainly count him out anyways."